Quite literally whittled into the sheer stone face of an adjacent cliff, we could just make out the light shape of Ostrog Monastery from our comfortable perch at the Hotel Sokoline. 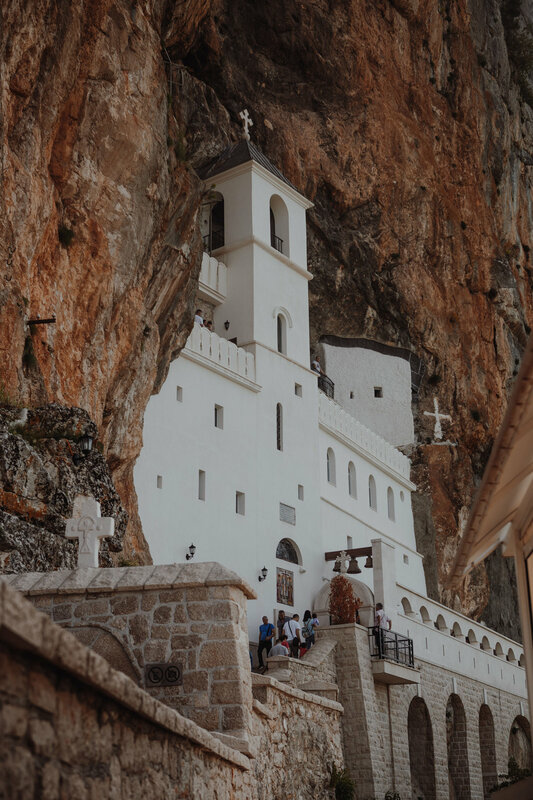 The Monastery is one of the most sacred sites in the Serbian Orthodox religion, and is the most popular place for pilgrimage in Montenegro. It is customary for devotees to walk 3 km of grueling steps barefoot from the lower building complex to the visually stunning upper Monastery (but we just drove to the upper parking lot instead). The Monastery was founded by and is now dedicated to St. Basil of Ostrog, with whom we had an interesting interaction after following a group of religious pilgrims into a small cavern-like passage near the main entrance to the building. After cluelessly queuing for a few minutes, we finally found ourselves crouched over an open casket reliquary containing the lightly veiled remains of Saint Basil himself. Imitating the group before us, we lowered our heads into the casket and awkwardly kissed the air above the Saint before glancing up at the scraggly old holy man keeping watch for some kind of instruction or validation. Met with a blank stare, we left the cave and hobbled over to the gift shop bewildered by this macabre morning surprise. After about 5 minutes of browsing, we spilled an entire container of frankincense all over a counter covered in gold-leaf embellished trinkets. This was a sign. It was time to go, enough damage had been done for today. We hopped in the rental car, bound for a small lake-side town called Virpazar; population 337. The town straddles a river that flows into the massive Skadar lake, a portion of which is pictured above. The lake lies on the border of Montenegro and Albania, and is the largest lake in Southern Europe. Surrounding Virpazar is a pleasing landscape of vineyards and countryside cradled by waves of karst landscape. Our accommodation for the next couple of nights, Eco Resort & Winery Cermeniza (yay again for credit card points! ), featured an awesome view of this area from its sunny poolside as well as a choice selection of wines squeezed from grapes grown right on the property. For dinner we enjoyed fresh, delicious Lake Skadar carp amongst the aging barrels in the family vineyard’s wine cellar. Sometimes hanging out inside the comfort zone for a while ain’t so bad at all.